These Armor Legs pieces are made of 16 Ga. Carbon Steel and are Polished to a Brilliant Sheen. They are surprisingly comfortable and are built to fit the rest of us that ARE NOT built like CONAN. They have a contoured shape and fit and fit a wide range of sizes from a 30" to 33" pants inseam and a variety of body builds. Comes with adjustable leather straps for secure fit to the leg and thigh. Designed to be worn over clothing. Minimum Size - 5' 8" at 155 lbs. Maximum Size - 6' 2" at 270 lbs. 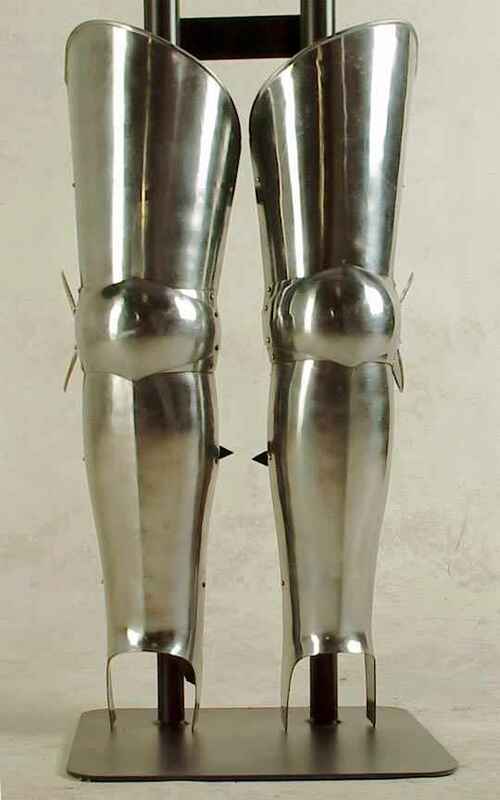 The Western European suits of armor known as Gothic armor were some of the latest full suits of armor to appear, coming into its full glory in the 15th century. The Germanic tribes, which were the groups that occupied Western Europe and formed the Holy Roman Empire, had evolved from the early Goths and Huns who began to invade Europe as early as the 3rd century. The Goths who were about 100 years ahead of the Huns eventually evolved, after much infighting with each other, into two main groups: the Visigoths who first joined the Romans and received military aid along with food supplies as a mercenary tribe that were known as federates and the Ostrogoths who joined forces with the Huns to fight. Both alliances eventually deteriorated, fighting with their former associates, the Romans and the Huns. By the 6th century, these groups no longer existed and remained as a conglomerate that we think of as the Germanic tribes. The Franks emerged from this group taking over most of Western Europe and the fall of the Roman Empire via the Visigoths a few centuries previously, allowed the emergence of a new state: the united Holy Roman Empire. This was the conglomeration of the Germanic tribes and the conquered territories of the former Western Roman Empire which is where we look for Gothic armor. These territories included Italy, Belgium, parts of France, Switzerland, Bohemia, and of course, Germany. Most recognize the formal recognition of Charlemagne as Emperor in 800 AD as the beginning of this era although many feel that it was not defined until Otto I, was crowned in 962, as there was still much fighting and territorial grabs occurring during that 150 years. Most scholars do agree that it was an evolving process of imperial rule that occurred over several hundred years with the actual name “Holy Roman Empire” not emerging until the 13th century. The Gothic armors that now in modern times that we see very widely in their look due to the differences in the cultures of the various areas of Europe. Most of the suits were stylized to their individual state, as Italian suits would bear certain designs completely different from those used in Germany or Switzerland. Each Gothic suit is fascinating in its unique stamp and each has history. 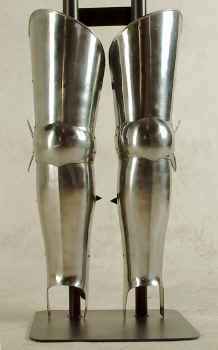 These wearable legs of armor, consisting of a tasset and greave, that are shown here are modeled from mid- 15th century, probably Italian in origin or a modern interpretation of such. Their plainer aspect makes them versatile to complement any Gothic breastplate of that time period.